As an editor of 12 years myself, I am often asked why proofreading a document is important. As far as I’m concerned, what you write is a reflection of you. If your document is full of errors, people won’t take what you have to say seriously. By proofreading your document, you will be ensuring that the only thing people see, is what you actually mean. All those words bouncing around in your head as you write may sound good, but once on paper it needs to be translated well, otherwise confusion for the reader can become a real issue. From university application forms, dissertations or even papers being submitted for publication in professional journals, our team of professional editors will work with you to create a file that is free of errors and which looks professional. 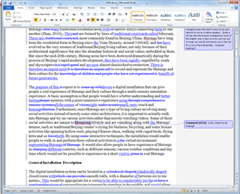 Having your academic papers professionally edited can make all the difference. Imagine firing off your application form only to later realise that there was an unmistakable error in what you wrote. At which point, it’s too late to do anything about it. It is hugely important to check academic papers for spelling, grammar, punctuation, etc., before sending it to be reviewed. So, by some miracle the application board missed the error in your application and you got in… they won't be so easy to get by when it comes to handing in reports and dissertations. You don’t want to be that student who constantly has to be complained at for inconsistency and submissions full of errors. You’ve worked hard to get to the point you’re at, and we believe that with our help you can go even further. So you've decided to drag an old CV out of retirement, or even gone the extra mile and written a new one out. Why is it important to have it checked for errors? Because this is the first impression of you that a prospective employer gets, and it doesn’t take a rocket scientist to work out that if you haven’t had the foresight to check your own CV for errors, you won’t give all you have to the job your applying for, it simply states that you aren’t a person who takes the small things seriously. Sure, you may know that you’d be perfect for the job, but your CV just got filed under “bin” simply because, if you can’t write your CV correctly, what chance do you have of meeting their exacting standards? When writing your CV, you need to bare in mind that for every job opening, there are potentially hundreds of other people sending in their own CV’s. This means that the employer has to read through hundreds of CV’s and whittle them down to a select few. Any reason is good enough to remove them from the list – even errors in a CV! It is expected of businesses these days that every written piece of information regarding the company is formed coherently and correctly. Professionalism is important in today’s fast-paced world. Sending out a newsletter to prospective customers riddled with errors will see the message go ignored, or even worse, will see the recipient hovering over the link to be removed from your mailing list, thus, you lose that customer completely. When placing text advertisements in popular local periodicals, it is necessary to take care in advance about check for grammar, orthography and phonetics. This will give a solid basis and foundation for holding positions in the local commercial market, positioning own products as by the right of the company pretending to recognition by the local population. As that is popular editions that set the tone in promotion of this or that product, and upon right combination with correctly prepared text it will give a powerful result and incentive to development of the company in this market. Check and proofreading of the English text always require immense responsibility before own customers, that gives the possibility to develop good cooperation with the company-proofreader of texts on a permanent basis. This company will always suggest you the highlights and nuances of development of texts and articles on the highest level. Proofreading your own files is all well and good, but the problem is, you know what you want to say, so no matter how many times you read it, it will look correct to you. A good example of this is having someone write out a paragraph on a particular topic, and then have them read it aloud to you. It is amazing how many times you will notice, as they read, that they add words that aren’t on the page, or neglect to read ones that are.